CROFT, W. G., A.B., Royal Navy. He joined the Navy in August 1912, and at the outbreak of war was posted to H.M.S. "Cornwall" and sailed to the South Atlantic, where he was in action in the Battle of the Falkland Islands. Subsequently he was engaged in the Naval operations at the Dardanelles until the close of that campaign. On one occasion his ship was torpedoed, but fortunately he was rescued after clinging to a raft in the water for forty-eight hours. He holds the 1914-15 Star, and the General Service and Victory Medals, and in 1920 was still serving at sea. 23, Landells Road, East Dulwich, S.E.22. CROFTS, C., Private, M.G.C. (Cavalry). Having enlisted in 1906, In the 19th Royal Hussars, he was at Chatham on the outbreak of war, and immediately proceeded to France, where he took part in the Retreat from Mons, and in the Battles of Neuve Chapelle, Ypres, (II) and Loos. Later he was in action on the Somme, and at Arras, Vimy Ridge and Cambrai, where he was wounded, and being invalided to hospital in England in January 1918, remained on Home Service until his discharge in February 1919. He holds the Mons Star, and the General Service and Victory Medals. 12, Bestwood Street, Deptford, S.E.8. CROLY, C. P., Sick Berth Attendant, R.N. He was serving in H.M.S. "Formidable" on the outbreak of war, and was present at various Naval engagements, including that of the Heligoland Bight in the very early stages of the war. He was discharged as unfit for further service in September 1915, just before his ship was sunk in the Channel. He holds the 1914-15 Star, and the General Service and Victory Medals. 20, Trinity Road, Rotherhithe, S.E.16. CROLY, F. D., Gunner, R.F.A. A Reservist, he was mobilised on the outbreak of war, and proceeding to France with the Expeditionary Force, did good service in the Retreat from Mons, and later in the Battles of Ypres (I), Festubert, the Somme (I) and Vimy Ridge. He also took part in the actions of Ypres (III), Passchendaele Ridge, and Cambrai, and serving through the Retreat and Advance of 1918 saw fighting at Havrincourt and Epehy, entered Mons on Armistice Day, and went into Germany with the Army of Occupation. Demobilised in April 1919, he holds the Mons Star, and the General Service and Victory Medals. CROLY, J., Corporal, 9th East Surrey Regiment. Volunteering in September 1914, he passed through his training and was drafted to France in August of the following year. He saw much heavy fighting at Loos, St. Eloi, and on the Somme, being wounded at Guillemont in August 1916. Later he fought at Vimy and Messines Ridges, Ypres and Passchendaele. He also was in action in the Retreat of 1918, being again wounded at St. Quentin in March. As a result of this wound he was invalided home, and discharged as no longer fit for service in July 1919. He holds the 1914-15 Star, and the General Service and Victory Medals. CROLY, W. Private, 20th London Regiment. Joining in September 1917, he proceeded to France in the following March, and took part in the Retreat of that spring until wounded at Albert in April. The severity of the wound necessitated his being sent to hospital in England, and after treatment for some months, he was discharged as no longer fit for active service in March 1919, and holds the General Service and Victory Medals. CRONIN, F. C., Private, Somerset Light Infantry. He joined in January 1917, and after a period of training was drafted to France later in the same year, and took part in the heavy fighting in the third Battle of Ypres. He was reported missing on July 31st, 1917, and is presumed to have been killed in action on that date. He was entitled to the General Service and Victory Medals. 19, Clarence Street, Greenwich, S.E.10. CRONIN, J., Private, 8th Royal Munster Fusiliers. Volunteering in January 1915, he trained in Ireland, and was afterwards engaged on important duties until he unfortunately contracted pneumonia, and in consequence was discharged as medically unfit for further service in April 1915. He then offered his services for munition work and was employed at the Royal Arsenal, Woolwich, on the production of cartridges, and carried out these dangerous duties in a most efficient manner. 5, Ormiston Road, Greenwich, S.E.10. CRONK, G. O., Special War Worker. He enlisted originally in the King's Royal Rifles in 1905, was afterwards transferred to the Rifle Brigade, and served in India for nine years. On the outbreak of war he was in charge of the Blind Sailors' and Soldiers' Hostel in Regents Park, and continued in this duty until August 1918. He holds several Red Cross Medals. 14, Frankton Road, Peckham, S.E.15. CRONK, H. J., Stoker, R.N. He was already in the Royal Navy at the outbreak of war, and served in H.M.S. "Indomitable." He was sent to the North Sea, and took part in the Battles of the Dogger Bank, and later proceeded to the Dardanelles, where he was engaged on patrol duties and in shelling the enemy positions. Afterwards returning to the North Sea he served in the Battle of Jutland, and in other important engagements. He was demobilised in February 1919, and holds the 1914-15 Star, and the General Service and Victory Medals. 6. Bell Street, Greenwich, S.E.10. CRONK, J. C., Private, R.A.S.C. (M.T.) Volunteering in August 1914, he was sent to France in the following October, and served at Etaples, Ypres, Arras and on the Somme, rendering excellent services of a technical character. He performed work of this nature right through the campaign until the Armistice, after which he returned to England, and was demobilised in March 1919. He holds the 1914 Star, and the General Service and Victory Medals. 17, Elgar Street, Rotherhithe, S.E.16. CRONK, M. C. (Mrs.), Special War Worker. This lady volunteered in 1917 for work of National importance, and found most useful employment at the Royal Arsenal, Woolwich, being chiefly engaged in filling shells, and gaining much credit for her industry and skill at this delicate and dangerous task. She was finally discharged in February 1919. CRONK, W., Private, Buffs (East Kent Regiment). A Reservist, he was mobilised on the outbreak of war and drafted to France in October 1915, after a considerable period of duty as Instructor of recruits. He took part in engagements at Loos, Albert, Vermelles and Vimy Ridge. later he acted as Despatch rider in the 1st Battle of the Somme, in which he was wounded, but after evacuation to England he returned to France, and carried on his duties at Arras, in the Ypres sector and at Cambrai, also in the Retreat and Advance of 1918. Demobilised iu December 1918, he holds the 1914-15 Star, and the General Service and Victory Medals. 4. Bawtree Road, New Cross, S.E.14. CROOK, A. T., Sergt., 1/7th Middlesex Regiment. Volunteering in August 1914, he proceeded to France in the following year, and fought in the Battle of Ypres (II), in which he was wounded. 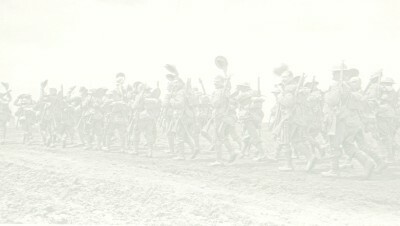 On recovery he was transferred to Egypt, but after six months returned to France, and took part in many actions, on the Somme where he was wounded a second time, at Arras, Givenchy and Camhrai, until contracting trench fever, which resulted in his being invalided to England, and finally discharged in February 1919. He holds the 1914-15 Star, and the General Service and Victory Medals. CROOK, G. F. (M.M. ), Sergt., 13th Rifle Brigade. Volunteering in February 1915, he proceeded to France in the following year, and did good service in many engagements, including the Somme Offensive, in which he was wounded, and actions at Arras, Ypres, Albert, and Cambrai, and in 1917 he was awarded the Military Medal for gallantry in a bombing raid. Serving right through the final operations of 1918 he was eventually demobilised in March 1919, and, in addition to the Military Medal, holds the General Service and Victory Medals. 12, Trident Street, Rotherhithe, S.E.16. CROOK, R. D. L. (Mrs.), Special War Worker. This lady volunteered in 1917 for work of National Importance, and was employed for a year at Woolwich Arsenal in the manufacture of shell covers, and parachutes. She carried out her duties with skill and care, and later did service at the Dockyard as Inspector of military clothing until the Armistice. CROOK, T., Private, 7th London Regiment. Volunteering in 1914, but not accepted until January 1916, he passed through his training, and was drafted to the Western Front in the following January. He was in action on the Ancre, and later at Arras, Vimy Ridge, Bullecourt and Ypres (III). He also took part in engagements at Lens, Cambrai and in the Retreat and Advance of 1918, serving right through until the Armistice. Demobilised in February 1919, he holds the General Service and Victory Medals. 17, Desmond Street, New Cross, S.E.14. CROSS, J., Corporal, 15th (The King's) Hussars. A serving soldier at the outbreak of hostilities, he was almost immediately sent overseas, and took part in the Retreat from Mons. He also served at Bethune and Ypres, and in the Somme sector, where he sustained a severe injury to his leg in an accident. He was invalided home, and subsequently was discharged as physically unfit in April 1916. He holds the Mons Star, and the General Service and Victory Medals. 58, Mill Road, Lewisham, S.E.13.